Acupuncture is a Traditional Chinese Medicine (TCM) that involves inserting fine needles into the skin to stimulate specific points across the body. 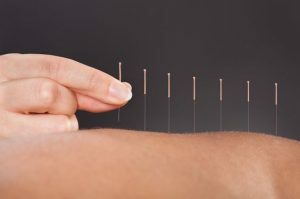 In addition to using acupuncture for allergies, the practice is used to alleviate muscular and joint pain and provide relief for various health conditions. As long as the needles used in your acupuncture treatment are sterile and meet minimum acceptable standards, and your acupuncture practitioner is certified and experienced, then the risks should be low. Minimal side effects may be experienced, such as soreness, bruising or minor bleeding at the point of insertion. These days, single-use needles are used and then disposed of, so any risk of infection has been negated. Which Allergies Can Acupuncture Treat? Acupuncture has been used to provide relief from symptoms of allergies such as hay fever, eczema, hives and more. How Does Acupuncture Treat Hay Fever? Hay fever is characterised by the inflammation and swelling of the nose lining. Roughly 3 million Australians suffer from hay fever each year, experiencing common symptoms such as sneezing, itchy eyes, blocked nose and more. You’ll likely experience some relief after your first acupuncture for allergies session, and that relief will accumulate over the course of multiple treatments to the point where you might even be able to control the symptoms rather than have them control you. How Does Acupuncture Treat Eczema? Eczema is a skin condition that is equally common among kids and adults, and presents itself as red, dry skin across the body. Sufferers tend to struggle to retain moisture in their skin, leading to highly irritating and distracting scratching. It’s typically triggered or exacerbated by scratching affected areas, bacterial or viral infections, swimming pool chemicals, allergens, heat, stress, and many other possible factors. Acupuncture can help eczema sufferers by reducing the itching sensation that can otherwise completely take over. Acupuncture helps to reduce dampness and heat – two factors that contribute to the itching sensation – plus it can also alter the brain’s response to itching triggers. The use of acupressure, which is the massaging of acupuncture points, can also aid in the reduction of itching. How Does Acupuncture Treat Hives? Hives is described as a skin rash that has been caused by an adverse reaction to foods, medicines or other possible allergens. It presents itself as red, itchy bumps, often looking like a group of mosquito bites, and will often subside without treatment (though antihistamine medication can speed the process up). While medication can be used to treat the symptoms, advocates of acupuncture for allergies like hives believe that TCM can be effective in reconfiguring the imbalance of energy from inside that causes the breakout of hives. If physical symptoms are raised and red in colour, it’s believed that there’s an excess of heat energy in the body, however if hives present themselves as white, it’s believed that the sufferer has an excess of cold energy. The aim of acupuncture treatment in this scenario is to move the excess energy through the body, and in doing so, find stronger energy to temper the hive response and reduce the physical symptoms. What Other Services Are on Offer at Melbourne Natural Medicine Clinic? In addition to providing acupuncture for allergies and acupuncture treatment for nausea, Melbourne Natural Medicine Clinic offers a variety of additional health and wellness services at our natural therapy clinic. Whether you want to see a nutritionist, a naturopath, a chiropractor or any of our other experienced practitioners, we do our best to provide quality treatment and care. Call us on (03) 9686 2566 to make an appointment.